Do you want a low maintenance kitchen when you remodel? An important consideration when planning to remodel your kitchen is how much time you plan to spend cleaning and maintaining the cabinetry. It will only look beautiful for years to come if you care for it on a regular basis. With today’s hectic lifestyles, few people want to spend their precious free time cleaning. Of course, if you can afford it, you could hire someone to do this work. But for the moment, let’s say that’s not an option. 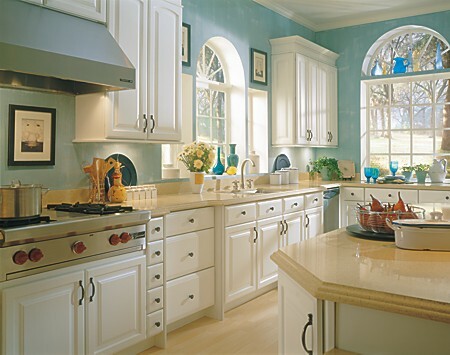 White cabinetry is very popular, and one type of white cabinetry is particularly easy to clean. Thermofoil cabinets are an easily maintained product. Sleek and smooth-surfaced, Thermofoil cabinetry from Schrock offers a sophisticated appearance along with exceptional durability and ease of maintenance for today’s hard-working kitchen. You should be aware that White and Cashmere color may change slightly over time, depending on environmental conditions. Thermofoil is a process where heat and pressure are used to bond a thin layer of PVC (Polyvinyl Chloride) film to a shaped and glued component made from MDF (medium density fiberboard). The result is a seamless surface that covers a panel’s face and edges. The component back uses a white, seamless melamine surface – excellent for easy cleaning. A soft cotton cloth dampened with warm water is usually sufficient to clean your cabinets. If more thorough cleaning is required, please use a fresh solution of mild hand dishwashing liquid mixed with warm water. After cleaning, wipe all surfaces with a clean, damp cloth. Dry immediately using another soft, clean cloth. Click here to read more, such as cleaning products to avoid. Next time, we’ll talk about easy to clean and maintain countertop material.